Frequently the videos available to show on Trang web cá cược trực tuyến www.themiracleofkangaroomothercare.com are simple raw documentation of some vignette related to disability. Here is something with an extra element. I this video Jason DaSilva has applied his skill as a storyteller, actor, and filmmaker to craft something noteworthy -- "Gettin' Up the Stairs." Below is the video but check out the blog also When I Walk and the When I Walk Blog. Special thanks to travel agent Shirley Barber for alerting us to this video. Deaf 411 and Harris Communications have produced a short video on living as a Deaf person in an audio world. This short film plays much like a music video and tells a tale of one man's escapism and search for a 'better place' in a virtual world. The music is written and performed by Angryman. With appreciation to those who work hard and carry dreams that make for a better life! Vendors, Guess What You are Missing? Our Money! Debra Pollard, a Palmer resident who uses a scooter to get around, said vendors who choose not to provide access are losing customers. She enjoys the fair, she said, but refuses to go in shops where no attempt at providing access is made. "It's silly," she said. "It's money, people." Kathy Luchsinger made her booth of Alaska crafts a little more wheelchair friendly to Alaska fairgoers by screwing a piece of indoor-outdoor carpet into the ground, then smoothing things out with a few strips of duct tape. It cost her about $5. "There are plenty of ways to make areas more accessible. You don't have to spend a lot," she said. Even before the 2010 World Cup takes place in South Africa Brazil has rolled out its first professional training initiative for World Cup 2014 -- "Hello Tourist!" What we want to see now are plans for infrastructure accessibility and professional training on serving tourists with disabilities. The expertise is out there to be utilized. Our colleagues in the disability community working on World Cup 2010 accessibility in South Africa are ready to offer their services to the Brazilian disability community in developing their own program. Vamos la! Hello, Tourist! is a partnership between the Brazilian Ministry of Tourism and the Roberto Marinho Foundation whose objective is to teach English and Spanish to tourism professionals, especially those whose work is related to tourist assistance. This is the first professional training activity motivated by the Football World Cup, which will be held in Brazil in 2014. Until the end of 2010, we hope to reach around 80.000 participants in the states of Rio de Janeiro, Bahia and Amazonas. The distance-training course will be offered free of charge to waiters, taxi drivers, craftsmen and artists, receptionists, phone operators, local stall tenders, drivers and guides, among other professionals who are linked to the tourist. Using an online method, the course will use distance-training and custom-designed activities according to each region and to the area where participants work. Ana Paula [Doglio]'s original idea took two years to go on air, she is a psycopedagogyst with a master degree in disability and family, ' Desde la Vida' was first showed in April 2007. Ana Paula together with Fena host the show. Agustina, a teacher specialized in teaching children with special needs, is in charge of the corner of art, in which children with all abilities go and draw and paint pieces of art that once a year, always around December 3rd go on auction and the funds help some NGO in need. In the picture, what I could see behind the cameras, the ART CORNER, and the children working. Coming down to accessibility matters I went this week to shoot an interview that is going to be shown on Aug 29 th at 9am, Argentinean time, and it can be seen over the internet at http://www.tvpublica.com.ar/ then click in the play button that says VIVO. O projeto Olá, Turista! é uma parceria do Ministério do Turismo com a Funda? ?o Roberto Marinho. O objetivo é ensinar inglês e espanhol a profissionais da cadeia do turismo que atuam diretamente com o público. Esta é a primeira a? ?o concreta de capacita? ?o profissional motivada pela Copa do Mundo de 2014, que será realizada no Brasil. O projeto vai atuar em base local, mas com articula? ?o nacional, seguindo as diretrizes das políticas públicas para o setor, buscando sinergia e integrando-se à iniciativa privada e às diferentes instancias do poder público. Com isso, pretende-se envolver o setor turístico e toda a popula? ?o brasileira numa ampla campanha de aprimoramento para a recep? ?o de turistas. Come Swim with Dolphins - Unless You are Disabled! "I'm very disappointed. I traveled from Phoenix, Arizona, to here [Hawai'i], and I planned all these activities," Rivas said. "Everybody in this country has the right to enjoy all activities. And if there are ways to accommodate you, why not? I don't want this to continue happening to other blind people." Issues of safety were cited - at the last minute while Rivas standing there in front of the dolphins. Karla Rivas, 42, of Phoenix, has never allowed blindness to get in the way, KITV-TV reported. Her Hawaiian vacation was filled with adventure, from parasailing to scuba diving. But she had one dream left to fulfill. "I wanted to interact with the dolphins," Rivas said. "I wanted to enjoy that activity as anybody else would enjoy it." The National Council on Disability (NCD) will hold a national summit July 25 - 27, 2010, in Washington, D.C. to develop recommendations to guide Federal disability policy and programs over the next decade. The National Summit on Disability Policy will also commemorate the 20th anniversary of the ADA's enactment. Over 300 leaders and stakeholders will be invited and selected to discuss and present information on a range of topics, including civil rights, employment, education, health care, transportation, housing, telecommunications and technology, international affairs, homeland security, and demographics. For further information, including application forms and scholarship opportunities to attend the invitation-only event, visit NCD's website at www.neweditions.net/ncd2010/index.html. disability coalition controlled by a new generation of disabled activists. currently coordinating a Masters in Inclusive Education & Communities. government; race, gender & ethnicity. second decade of the ADA is coming to a close refreshed by amendments. encourage this reflection by celebrating the themes of past conferences. Impact: The Stories We Tell". presentation using these questions as a guide. *	What are your three main goals for the presentation? *	What will your participants learn? advocates, students, consumers, researchers, or other)? Able Radio is a station presenting information and entertainment for people with a disability or life limiting medical condition. Our programmes of course are also of interest to everybody and within the schedule we hope you will find different topics that are of interest to you. However, our focus is on disability and with all presentation by people who themselves are disabled we bring real life experience to the radio. This is also your radio station - opportunities exist to get involved via the forum or even by presenting on-air. Able Radio is based in South Wales although programming is focused on a larger region than just South Wales, attempting to include the rest of Wales. Above and beyond this we are offering an output that is of interest and relevant to the U.K. and can be potentially heard everywhere! Here re a serieds of videos feasturing reecord-breaking SCUBA diver Martino Florio. Some are in English and some in Italian. Leonard Cheshire pushes the envelope with Creature Discomforts. El Ministerio de Turismo del Ecuador trabaja para que se facilite la implementacion de programas turisticos mas eficientes que mejoren la inclusion de las personas con discapacidad. Corto de animación stop-motion realizado por Anna Solanas y Marc Riba. Vídeo educativo para personas con discapacidad. En Gallego. Edward Steinfeld, Arch. D., AIA is professor of Architecture and Director of the Center for Inclusive Design and Environmental Access (IDEA Center). His leadership in the area of Universal Design includes formulating the Seven Goals of Universal Design below. * Appropriateness - respecting and reinforcing cultural values and the social and environmental context of any design project. Edward Steinfeld, Center for Inclusive Design and Environmental Access (IDEA Center). Join the webinar on September 10, 2009 at 10am ET! Challenged by adjusting to new disability laws across the world IATA teams up with Open Doors Organization to create a unique webinar explaining how to navigate the new regulations. - How to locate information about regulations, how to implement the proper training, analysis of market statistics and 5 facts about people with disabilities. - Previews of upcoming training on US Air Carrier Access Act - CRO certification training and Inclusive design features in Airports (visual paging, animal relief areas, family/unisex restroom design, advanced wayfinding technologies for blind low vision). A peculiar form of ghetto policy has been promulgated on "as many as 133 trains under Southern Railway's jurisdiction" reports India Times from Chennai. The TN Association for the Welfare of the Physically Handicapped (TNAWPH) and the TN Disabled people Graduates and Physically Handicapped Welfare Association have protested against the move and have demanded that the railways scrap the new system and allow handicapped persons with general tickets to travel in the coaches in long-distance trains. The policy implemented on August 1 reverses previous practice. "Railway Protection Force (RPF) personnel and guards have thrown out several physically disabled persons from the coach stating that they were not holding reserved tickets," said K Gopinath, state deputy general secretary, TNAWPH. "I was thrown out of the Rockfort Express in Tiruchy because I had only unreserved tickets. The Railway Protection Force (RPF) not only did not allow me to travel but also detained me till the train left the station because I created a ruckus and pulled the chain," said R Thangam, state president, TN Disabled people Graduates and Physically Handicapped Welfare Association. "If the physically challenged reservation is not utilised or partially utilised, the vacant berths can be used by physically handicapped persons travelling unreserved. If the berths are vacant, physically disabled persons can board the coach with unreserved tickets enroute," [Southern Railway's chief public relations officer A J] Accamma said. The Canadian Paralympic Committee and gold medalist Paralympic athlete Joanne Kelly joined up with a group of Canadian travel retailers to announce a new program that highlights Canada's accessible travel experiences. Video package includes b-roll footage of the accessible tourism experience aboard an Ice Explorer vehicle and the GO CANADA announcement at the Columbia Icefield, including scenics of Athabasca glacier. Interview footage includes comments on Canada's accessible tourism experiences from gold medalist Paralympic athlete Joanne Kelly, Paralympic athlete Josh Dueck, and others. Called the Universal Design Living Laboratory, Rossetti's home will be built with unobtrusive universal design, resource and energy efficient green-building methods, advanced automation technology, a healthy home construction approach and the design principles of feng shui. The goal is to earn LEED Gold status. Rossetti led a seminar on universal design at the Hospitality Design Exposition & Conference in Las Vegas earlier this year. Her message to hospitality designers at HD: You can do better. "ADA is a minimum," says Rossetti, "why don't we want the maximum?" "Universal design is human centered," Rossetti explains. "It accommodates all people, of all ages and sizes. It's not about meeting requirements." This article will also be published in the September 2009 printed version of Lodging Hospitality Magazine. Q: When is Wheelchair Like a Guitar? ANS: When it Flies! How many times have you been sure this happened - even before your wheelchair came back broken! Titled United Breaks Guitars, the country-flavored ditty features actors posing as baggage handlers indiscriminately flinging guitar cases around an airport tarmac while Carroll strums his broken guitar. Two more songs and videos are planned. Let's hope one of them is about gold medal-winning Paralympist Christine Wolf's prosthetic legs. Or maybe Katrina Segundo-Casino's non-trip. Dave, we have enough material for an entire album. Want to do a song on Rajiv Rajan, Rami Rabby, Sminu Jindal, Adele Price, Lori Mango, or Margaret Quirk? Here are a few more sources of lyrics for the air travel blues. Read the full story behind the song here on Nova Scotia-based musician Dave Carroll's website. For guitars or adaptive equipment follow Bob Taylor's wise advice - know your rights and carry a printed copy of the policy with you when you travel. The Zoning Authority/Development Control of Dubai Technology and Media Free Zone is in the process of updating and creating a new universal design building code for all projects within its jurisdiction, according to a senior official. "Some chapters of the building code will probably be ready for presentation by the first week of October. It will be conveyed to all our consultants and contractors and compliance will be implemented for every building within our jurisdiction. "We also plan to possibly extend it to Dubai Municipality since we are working closely with the Dubai Civil Defence authorities," said Issam Jaouad El AlAoui, Senior Architect, Regulations and Compliance, at Zoning Authority/Development Control in an exclusive with Emirates Business. American Airlines: They Want to Take Us Higher! American Airlines and the American Association of People with Disabilities have announced the creation of the "Altitude Award" to honor the best U.S. television commercials featuring authentic depictions of people with disabilities. American Airlines and AAPD invite companies and advertisers to submit innovative, original television commercials that portray people with disabilities in a positive and progressive light. Entries must be submitted online at the award program's Web site by the producing agency or company and will be evaluated by a panel of judges. Five finalists will be selected for public voting. The finalist with the most votes will receive the Altitude Award, along with free advertising onboard American Airlines planes. The judging criteria for the inaugural Altitude Award will include overall appeal, authentic depiction of an individual with a disability, and clarity of message. Only spots that aired between October 1, 2007, and March 31, 2009, are eligible for submission. See the Altitude Award Web site for complete program guidelines. Manifesto: "I'll Go Wherever You Will Go"
Cofounder of India's AccessAbility, Shivani Gupta, appears on the TV show "If I Were Prime Minister. Brazil's MetaSocial Institute that has promoted social inclusion in Brazil and abroad for over 15 years. They are now coordinating a worldwide campaign for inclusion and against all forms of discrimination, to be launched in New York City on September 6th, at the Brazilian Day Street Festival. The virtual campaign - pre-launched in Brazil in March this year - is called "It′s Normal to be Different". It was developed in partnership with PR Agency Giovanni Draft FCB and Rede Globo Television Network and described by the Brazilian press as the "Facebook of Diversity". In the never-ending quest for the proper linguistic tools for travel I have been introduced to a very basic item of German vocabulary - Bordrollstuhl - the narrow wheelchairs that airlines use to get passengers down the aisles. Avid traveler Bonnie Lewkowicz had grown tired of being shut out of bargains on Hotels.com, just because she needed a wheelchair-accessible room. "It just didn't seem fair that travelers with disabilities were unable to take advantage of the convenience and low-cost options of booking hotel rooms online," recalls Lewkowicz. So she resolved to do something about it. Andrea's Buzzing About - Ramps! Andrea has me laughing at accessibility foibles in her post Getting there ... or, Not. It's all in the photos. A segunda edi? ?o do Seminário Brasileiro de Turismo Adaptado reúne diversos profissionais ligados ao Turismo e à Pessoa com Deficiência, apresentando experiências reais da evolu? ?o do turismo acessível no Brasil e no mundo. A acessibilidade e a inclus?o, apesar de muito comentada pela sociedade, ainda n?o é compreendida adequadamente pela maioria das pessoas, por isso a importancia de eventos como este, que promovam a informa? ?o de forma correta e atualizada. Este segmento tem crescido, e mostrando que n?o cabe mais uma vis?o de assistencialismo, mas que é uma grande oportunidade de mercado para quem souber aproveitá-la, e que aos poucos tem sido cada vez mais valorizada e exigida. Some narratives of disability drain off the joie de vivre before the story ever gets told. I never enjoyed that recipe. That approach is a bit hard to do when talking about the lives of Randy Earle, Alicia Contreras, and Nathasha Alvarez. As people with disabilities it goes without saying there is a story line that could be explored where difficulty dominates - but there is so much more of interest going on that begs to be told. So here is invitation to briefly brush past three noteworthy people who, because they experience disabilities, bring something different to the way they get on with life. Maria Gilda L. Quintua lives in the Philippines. English is not her native language. Sign language is. Gilda created M.G.L.Q. Deaf Tour Travel Agency to serve deaf travelers in the Philippines. Not content at this pioneering effort she has teamed up with Kathy Chai in Malaysia at Malaysian Deaf Tours. Nathasha Alvarez lives in Miami where she speaks her mind - and gives others a forum to do the same. Founder of Audacity magazine Nathasha, born with Osteogenesis Imperfecta, has a knack for finding topics and authors to speak to the disability community. Enjoy the lead featured story in the July 2009 issue as it sidesteps the stereotypical disability narratives while talking realistically about physical and sensory deficits. See Kara Ayer's Discovering the Sensual Side in You. O Projeto Rota da Liberdade, concorreu com 611 proposta de 81 países e foi selecionado entre os 10 melhores projetos do mundo como alternativa inovadora no turismo e projeto de alto impacto social como solu? ?es para problemas mundiais. A Rota da Liberdade segue as orienta? ?es da Unesco para o Turismo Cultural, através de seu projeto mundial "Rota do Escravo", mostrando através da história, cultura, arquitetura, gastronomia, dan?a, música e religiosidade, a influência dos africanos e seus descendentes na cultura brasileira, tendo os destinos e roteiros turísticos como vitrine dessa influência. O projeto busca também parcerias e patrocínio para tornar seus roteiros acessíveis para pessoas com deficiência. (St. Petersburg, Florida - August 10, 2009) -- Freedom Scientific today announced that it is now providing FSReader, its popular DAISY book reader, free to users of its PAC Mate? and PAC Mate Omni? accessible Pocket PCs. "Because we feel very strongly about the importance of making books and other materials accessible to those with vision impairments, we are lowering the price of FSReader to zero," said Jonathan Mosen, Vice President of Hardware Product Management for Freedom Scientific. "FSReader is a powerful tool for efficiently navigating and reading professional, educational, and leisure material in DAISY format, and we want to make this enhanced productivity available to every PAC Mate user." In addition, users who install Freedom Scientific's JAWS 11 and MAGic 12 products later this Fall, will be pleased to discover that both products include the full desktop version of FSReader DAISY player. This will be the case with Demo versions of JAWS and MAGic as well. Is it Perpetually the "Silly Season" in Washington DC? At any given time almost anyone in the world can find something that they agree with, something they disagree with, and something that is downright silly being debated in Washington DC. First and foremost, sidewalks augment safety and accessibility for everyone. The Americans with Disabilities Act and "Universal Design" principles call for sidewalks. Sidewalks enhance safety for all: parents with strollers or taking a walk with pets; kids walking to school; and anyone ambling along with a cane, walker, set of crutches or wheelchair. First reports from the Pune Seminar, "No Disabilities - Infinite Possibilities" show it to have been a great success. Lead up to the event was a 'Universal Design' Competition for Students of Architecture in Pune in expert collaboration with DRDF ( Disability Research and Design Foundation), Mumbai and Indian Institute of Architects, Pune. Winners were the team of Tanuja Godse, Pallavi Dhomse, and Shraddha Deo was from the BKPS College of Architecture, Pune. The American Association of People with Disabilities told federal court judge Denny Chin that "vast numbers of books will be opened up for many people for the first time ever," citing the fact that Google Book Search will digitize books into formats that can be used by specialized readers. The nonprofit group asked the court to approve the controversial copyright settlement that Google struck in 2007 to settle a class action lawsuit filed by authors and publishers. That's good news for the search and advertising giant, given the settlement is under investigation by the Justice Department and is facing stiff opposition from rights groups and some authors. They are concerned that the settlement will give Google a monopoly on the world's digital books, leading to problems with censorship, tracking and price gouging. This Caring Home is a project of Weill Cornell Medical College. The aim of the project is to create an online resource on dementia. NOW OFFERED VIA DISTANCE LEARNING! This course will place emphasis on knowledge and theories about disability rights, policy, and culture from a diversity perspective in the context of multiple disciplines. In this context students will learn about legislation and policy affecting service delivery, multicultural issues, disability rights, and advocacy issues across the life span. Individual and team research projects will be encouraged. COURSE DESCRIPTION: This course provides knowledge and a foundational understanding of disability related cultural variances with the intent of supporting individuals from culturally and linguistically diverse backgrounds and their families across the lifespan. This course is designed for graduate and professional students, and instructors, in a variety of disciplines, including education, sociology, psychology, law, social work, political science, public policy, communications, American studies, architecture, health sciences, ethnic studies, and others. Both courses are core courses for the interdisciplinary Disability and Diversity Studies Certificate Program http://www.cds.hawaii.edu/main/certificates/ but can also be taken as an elective. Santa Cruz de Tenerife, 7 ago (EFE).- El Cabildo de Tenerife, a través de la Sociedad Insular para la Promoción de las Personas con Discapacidad (Sinpromi), ha convocado la IV edición de los Premios de Arquitectura Accesible, informó hoy la corporación insular. Estos galardones, de carácter bienal, nacen con el objeto de promover el dise?o universal, que recoja los requerimientos de todos los ciudadanos, sea cual sea su condición física, psíquica o sensorial y por una manera de concebir nuestro entorno, donde la accesibilidad se incorpora desde la concepción del proyecto, integrada y desapercibida. Estas distinciones tienen el fin de reconocer públicamente las actuaciones, tanto públicas como privadas, donde se haya contemplado la accesibilidad de manera ejemplar, que favorezca un cambio en la concepción del espacio, premiando actuaciones normalizadoras, donde la accesibilidad es desapercibida. Además, pretenden fomentar en los estudiantes de formación profesional y universitarios, un cambio en la manera de contemplar el entorno, premiando aquellos proyectos finales que reúnan las características antes mencionadas. Los premios se establecen en dos categorías; para la primera pueden optar aquellos trabajos profesionales realizados en el ámbito territorial de la isla de Tenerife, con certificado final de obra visado hasta el día 2 de octubre de 2009. La segunda categoría está dirigida a proyectos finales de carrera o ciclo formativo de estudiantes residentes en Canarias, aprobados por la universidad o escuela correspondiente hasta el 2 de octubre de 2009. Asimismo, Sinpromi y el jurado de estos premios podrán proponer, para su incorporación al concurso, las candidaturas que por su relevancia y mérito consideren oportunas. Who will take up the think tank role for Inclusive Tourism in South Asia and South America? The Think Tank Initiative supports independent policy think tanks in developing countries, enabling them to provide sound research that both informs and influences national-level social and economic policy, mainly in the areas of growth, equity, and poverty reduction. The initiative will focus its activities in East and West Africa, South Asia, and Latin America. Initial funding for the program has been provided by the William and Flora Hewlett Foundation, the Bill & Melinda Gates Foundation, and the International Development Research Centre. The initiative has announced Calls for Expressions of Interest in Latin America and South Asia. The initiative will provide multiyear core funding and technical support to successful think tanks. In Latin America, eligible institutions in Bolivia, Ecuador, El Salvador, Guatemala, Honduras, Paraguay, and Peru are invited to apply. In South Asia, eligible think tanks in Bangladesh, India, Nepal, Pakistan, and Sri Lanka may apply. Applicants must be existing nongovernmental, not-for-profit organizations that are legally founded and registered as independent entities in their country of operation. Applicants should be able to demonstrate that they are nonpartisan and committed to publishing research findings in the public domain and contributing to public debate. For more information about the Think Tank Initiative and for details on how to apply, visit the initiative's Web site. Check out the blog posts at OpenBritain.net by Craig Grimes. In line with international best practices in the hotel industry, the government has now made it mandatory for all hotels to become differently abled-friendly. Existing and new hotels of all categories all over the country would now have to comply with the requirements for the differently abled persons in respect of accessibility, special rooms with bathrooms and facilities in the public area by September 1, 2010, according to the revised guidelines. Tourism ministry has tried to address major concerns to make the classification norms friendlier for differently abled persons by adopting the international best practices, an official release said. In order to keep abreast with the contemporary requirements of the hospitality industry, Ministry has recently reviewed the norms for approval of hotel projects and guidelines for classification of hotels. The changing requirements of international and domestic travellers clubbed with emeging safety and security consciousness in view of the recent incidents in the country necessiated a review of the hotel classification norms which were last reviewed in 2003. These guidelines have been finalised by the tourism ministry after several rounds of interaction with and inputs from the hotel industry and the related stakeholders. Revised guideline have also taken into account the issues regarding safety and security as per which depending on the star category hotels are now required to have metal detectors, CCTV, X-ray machines, under belly scanners to screen vehicles, verification of staff and suppliers. Food and beverage outlets (restaurants) in the hotels have also been rationalised. For this purpose, the minimum number and type of restaurants have been allocated depending on the location of the hotel in the country based on a system of Grade A and Grade B cities. The Grade A cities would comprise of major metropolitan cities like Mumbai Delhi would include the hotels located in Gurgaon, Faridabad, Ghaziabad, Noida and Greater Noida. Grade B cities would comprise all other cities not covered in the Grade A. Hotels located in Grade A cities would require to offer more types of cuisine, number of food and beverages outlets compared to Grade B cities. With a view to provide high standards of service, it has been made mandatory for hotels to have minimum percentage of trained supervisory and skilled staff possessing degree/diploma/skilled training certificate from central/state Institute of Hotel Management, Food Craft Institute, or from National Council for Hotel Management and Catering Technology affiliated or from other reputed hospitality schools. Norwegian Cruise Lines has now introduced agent training for disabled passengers on the cruise line. The company's online training programme has introduced a module on accessibility, designed to provide agents with knowledge of the line's facilities and policies to sell cruises to disabled passengers. Andy Wright, managing director at Accessible Travel, which specialises in holidays for disabled, wheelchair and elderly guests, was involved in the creation of the training module. Boa notícia para as pessoas com mobilidade reduzida em S?o Paulo: a frota de ?nibus com acessibilidade para os portadores de deficiência física aumentou em 54% em 2009, em compara? ?o com 2007. Em 2007, 2.263 ?nibus regulares da capital paulista, o equivalente a 15,02%, tinham ?nibus adaptados com elevadores de acesso e espa?o para acomoda? ?o das pessoas com mobilidade reduzida. Em 2009, o número cresceu para 3.492 veículos, equivalente a 23,5%. As informa? ?es do indicador Acessibilidade est?o no Observatório Cidad?o - mantido pelo Movimento Nossa S?o Paulo - no tema Transporte/mobilidade urbana. A má notícia é que a frota total de ?nibus rodando pela cidade tem neste ano 235 veículos a menos do que em 2007. O número caiu de 15.067, em 2007, para 14.832, em 2009, conforme dados divulgados pela prefeitura de S?o Paulo. VIA Rail, Brewster Inc., and LUG to launch www.gocanadatravel.ca. our Paralympic athletes," said Michael Hannan, President & CEO, Brewster Inc.
destination for persons with a disability." Flight Centre VP of Strategic Partnerships. Canada's Paralympic athletes as they go for gold in 2010.
of the richest legacies a host country of a Paralympic Games can experience. We are very proud to be partnering with companies who recognise this." athletes go for gold in 2010 visit GO CANADA at www.gocanadatravel.ca. For many of us, packing up the car and heading for a weekend getaway can take minimal preparations. Head out to the cottage or book a hotel room, pack a cooler, bathing suit and some supplies and head out on the open road. But what if it wasn't that easy? What if you were in a wheelchair? Individuals facing mobility challenges aren't as fortunate to be able to leave town for the weekend. There are so many things to think about such as..."Will the place be accessible? Can I get into the bathroom? Can the restaurants accommodate my needs?" Not only are there limited vacation places with wheelchair access, but most importantly, as many individuals with disabilities live on assisted income, the cost of taking a vacation is just not feasible. India: Poised to Become Even More Incredible? New Delhi, Aug 5 (PTI) In line with international best practices, government has now made it mandatory for all hotels to become differently abled friendly. In December 2008, a number of major German INGOs hosted a conference in Berlin, Nothing About Us Without Us - Persons with Disabilities as Actors of Sustainable Development. Unusually, all the speakers were disabled people. The main message coming out of this meeting, consciously reflecting the provisions of the Convention (especially Article 33), was that disability was no longer to be seen as a welfare issue, but more about the active participation of disabled people and the strengthening of their human rights. · Organisations working FOR persons with disabilities are often limited to programmes of welfare and care. As a result partnerships are recommended WITH DPOs to guarantee participation of persons with disabilities. · Instead of just providing resources it is important to encourage the contribution and involvement of DPOs in order to generate a feeling of ownership. · For sustainable development it makes more sense to train local staff (also disabled persons) in the South in order to become more independent in the long run from experts from the North. · Persons with disabilities need to become more visible, for example they need to appear as speakers at events, in public and in the media. Only in this way can the public perception of disability be changed. · Specific programmes for women with disabilities are needed, as they suffer multiple discrimination in many countries. · Persons with intellectual disabilities are virtually unrepresented by DPOs. To include this group more, information resources should also be published in simple language. This is a useful start, but it is only a start. INGOs still have to learn how to be genuine allies by heading the advice of David Werner, who said "... it is time for non-disabled professionals to recognise the right of disabled people to self control, and therefore to gracefully step to more side, into a role where they, as professionals, are no longer on top but on tap.' Until they fully embrace this model of working, they will remain part of the problem, not part of the solution and disabled people, especially in the South, will be denied the rights the Convention seeks to guarantee. The variability of response should be instructive to hotel marketers. This market demographic knows what it wants -- and votes with its money when it doesn't see it reflected in the product! Congratulations to the Ramada Plaza Menam Riverside in Bangkok! In my long experience as a traveler using a wheelchair I have encountered numerous excellent examples of design, countless instances of good intention, and a few close encounters with disaster. What I encounter far too infrequently is a marketing piece that is as boldly and systematically designed to meet the information needs of a wheelchair-using traveler as the one I show below. This piece, presenting the Ramada Plaza Menam Riverside Bangkok, is remarkable. My congratulations. 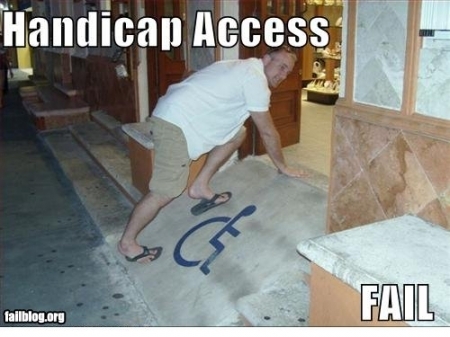 First, let me disabuse those who retain the false hope that international hotel chains systematically apply ADA-inspired best practices in their facilities around the world. Clearly the poor business practice prevails of reverting to exclusion-by-design. Often this occurs when building in countries without the legal "constraints" mandating just service to all guests equally. Secondly, let me point out the obvious fact that a few of the solutions presented here are simple work-arounds to the consequences of allowing such bad design to become accepted practice even by chains that know better. And yet, that is precisely the reason that I single out the Ramada Plaza Menam Riverside for applause. 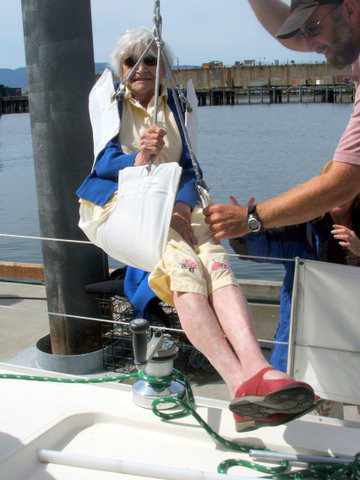 It is a global hospitality industry environment where retrofitting for accessibility is the best product available to the millions of aging Baby Boomers who are taking to the air, sea, trails, and roads. Rather than hide that fact this hotel has made major strides improving what it had to work with - and rises far above its competition. They have discovered that we are a savvy market ready and able to make choices in our own best interests when provided with sufficient information. I realize that some will insist on a hotel in which full independence of mobility has been achieved. Such a design is possible -- and by creating the market demand we drive hotels to rise to our availability as consumers. But to those guests who find "assisted accessibility" to be incompatible with a sense of dignity I remind you that in many cultures (West and East) it is a sign of status, not stigma, to be served by others. In that cultural context I commend the Ramada Plaza Menam Riverside for adapting to changing demands from the travelers-with-a-disability market by removing barriers , training staff, and then prominently presenting a dignified portrayal of guests with wheelchairs enjoying the hotel's hospitality. New Zealand: Get up. Stand up. Stand Up for Your Rights! Bob Marley would be proud of Laura Eitjes. We certainly are! By refusing to cower in the face of injustice she has spoken with the voice of millions around the world who reinterpret the singer's lyrics to say, "We sick an' tired of-a your [disabled]ism-skism game..."
Tauranga blind woman Laura Eitjes has won a landmark out-of-court settlement after she was forced out of her accommodation unit because she had a guide dog. Ms Eitjes, 36, has been awarded $8000 compensation for the emotional stress she experienced while holidaying two years ago with labrador Rua and a friend. They had already stayed one night in the lodgings when the husband and wife owners refused her a second night's lodgings because of Rua. Although no stranger to striking resistance to Rua from services like restaurants, taxis and dairies, issues were usually resolved straight away. This time the wife stood her ground and would not listen to reason. "It was the most blatant refusal I have ever encountered - Rua is a part of me," Ms Eitjes said She said she felt despondent and completely humiliated. "I don't see myself as disabled in everyday life," she said. "Occasions like that bring home to me how some people see me as different from everyone else - as disabled." The terms of settlement prohibits publication of the name of the business, the town where the incident occurred and type of accommodation. Ms Eitjes said the wife was clearly unwelcoming when they arrived at the North Island town during a two-week holiday in February 2007. Sensing hesitation, Ms Eitjes explained the law that made it unlawful to deny someone a service on the grounds of their disability. Rua stayed inside the unit on Friday night but resistance turned to opposition when they returned on Saturday afternoon to their lodgings. Rua's bed and bowls had been shifted outside. "I tried to explain to her that Rua was a guide dog and guide dogs had certain rights. But I was cut off at every attempt, and she flatly refused to let Rua back in." No amount of persuasion could change the woman's mind, so the holiday makers paid their bill and moved to a motel where the owner welcomed Rua. Ms Eitjes always made it clear when she booked accommodation that she was blind and had a guide dog. The upshot of the episode was that she complained to the Human Rights Commission which offered mediation to the two parties. The owners unwittingly made history when they decided to take the case to the Human Rights Review Tribunal. Robert Hesketh, the director of the Office of Human Rights Proceedings, said it was the first time that proceedings had ever been issued on behalf of a blind person being refused access to a service because of their guide dog. The case dragged on for so long partly because the defendants decided to represent themselves and were "bewildered" by the legal processes. Mr Hesketh said when the owners finally decided to instruct a lawyer, it led to a prompt settlement consisting of an unreserved apology and payment of $8000 compensation. Difficulties encountered by blind people were generally sorted out at a low level of intervention, such as by the Royal New Zealand Foundation for the Blind. Failing that, complaints could be taken to the Human Rights Commission, although few were received, he said. Ms Eitjes donated $5000 of the compensation to the Royal New Zealand Foundation of the Blind's guide dog services. She said she felt stressed when service operators balked at Rua. Occasionally she had been forced to call police or, on one occasion, the Chief of Security at Auckland International Airport. Ms Eitjes wants to get the message across that it was not okay for service providers to treat someone with a disability any less than someone else. Tauranga Moteliers Association president John Masson of Macy's Motor Inn said it was common practice for motel owners to ban pets from units but a guide dog was totally different. "This was crazy stuff. I would have no hesitation whatsoever in allowing them into to a unit." "Laura won the battle and good on her. She did the right thing." Ms Eitjes has been legally blind since the age of 17 from a hereditary degenerative eye disease. Her sister Paulien is three-times world blind match racing sailing champion. Martinique's budget accommodations have expanded with the opening of the new Centre International de Séjour, the island's first-ever hostel. Located in Etang Z'Abricots on the outskirts of the capital city of Fort-de-France just 10 km from Aimé Césaire International Airport, the five-story facility opened in June 2008 with 65 rooms (130 beds). Six specially equipped wheelchair accessible rooms are also available for disabled visitors. Rates for private rooms start at just 75 EUR per room, per night. Download a .pdf announcement here. Inclusive Tourism specialists Joedson Nunes and Solange Barbosa are semi-finalists in the Geotourism Challenge. Let's vote them into the winning three! During the application period for the 2009 Ashoka Changemaker/National Geographic Geotourism Challenge I remained an impartial Featured Commentator. Now that one of our own members is a finalist, Joedson Nunes ("Nunes" to his friends), I am unabashed cheerleader! Some know that Craig Grimes, Jani Nayar, Ricardo Shimosakai, Nelida Barbeito and I visited Brazil together several years ago to evangelize on Inclusive Tourism. Nunes was behind the familiarizatin tour to the accessible adventure camp "Parque dos Sonhos" where we all zip-lined a full kilometer over a river valley. We forever became fans of Nunes' skills and professionalism. Below is an appeal from him to put his already blind-accessible Brazilian Slave Liberation Route tour into the top three finalists. Join me in voting for this project! We're in the finals of the Geotourism Challenge 2009! We need your vote to get to the world's top 3. The Route of Freedom follows the UNESCO guidelines for Cultural Tourism. UNESCO has a worldwide project "The Slave Route", showing through history, culture, architecture, gastronomy, dance, music and religion the African influence in Brazilian culture. It includes tourist routes and destinations as a showcase of that influence. Our project also seeks partnerships and sponsorships to make its routes accessible to people with disabilities. 1 - Register at this link: http://geotourism.changemakers.com/en-us? The U.N. Standard for the Equalization of opportunities for Persons with Disabilities, the Convention on the Rights of Persons with Disabilities, and the World Health Assembly Resolution WHA58.23 all point to the importance of wheelchairs and other assistive devices for those in need in the developing world. In light of the realities of the developing world, however, few of those who need wheelchairs have one and many who do have one have an inappropriate one; insufficient production facilities exist, and too often wheelchairs are donated without necessary related services. Since 1980, Whirlwind Wheelchair International has been designing good wheelchairs for active use in rough urban and rural areas in developing countries. These chairs are built in the countries themselves with local materials, and training is provided to local people in the manufacture and maintenance of the chairs, thus creating both business and employment opportunities in the community. Whirlwind Wheelchair International was a key contributor to the recently published WHO guidelines on the provision of manual wheelchairs in less resourced settings to assist WHO member states in creating and developing a local wheelchair provision system, thereby implementing Article 4, 20, and 26 of the Convention on the Rights of People with Disabilities (CRPD).